Picture Book &Live Review: Heavy Breathing @ Black Cat June 28th! Three types of rock showed up to DC’s Black Cat tonight. First, Pittsburgh’s Old Head brought us their skeletal sound; a core rock composed almost entirely of drums and guitar. Once or twice, they visited the keyboard and momentarily a harmonica was used. Old Head had very little to say, which left optimum time to rock and riff and cram their new age classic rock down our throats unapologetically. DC’s own More Humans took the stage next with their escalating three-pronged attack. The first stage is when guitarists Clinton Doggett and Marko Sonevytsky are playing and Doggett is singing solo. Things start to get flowing in stage two, when Sonevytsky adds his intense harmonization to Doggett’s melody. Stage three is when the dam breaks and drummer Andrew Fishbein kicks More Humans to a level that you might not have seen coming. They use this dichotomy on most of their songs, starting slowly and building to an apex that makes it seem like there are more than three musicians on stage. More Humans played their go-to hits, Dracula and Mason-Dixon, but they also played a lot of new stuff at this hometown show. Then the lights went out. And were replaced with strobes and lasers and fog and stars, reminiscent of a high-end college party. What came next was anything but juvenile. Also locally grown, Heavy Breathing came to the stage with a very unique look. One-third Luigi of Nintendo fame, one-third Polo-clad preppy, and one-third Velma if she had turned to a life of crime. 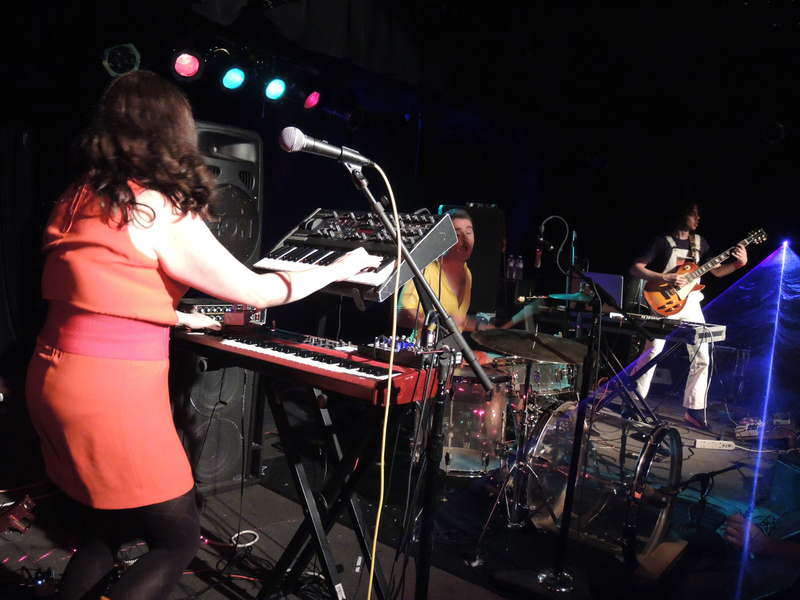 Amanda Kleinman, the keyboard/synth player got the crowd warmed up with a strange little monologue in a distorted witness protection voice. Then the microphone was retired because there are no vocalists in Heavy Breathing. Only recorded clips and snippets of other people’s voices wrapped up in intense electronic cardio rock. Amanda danced back and forth, guitarist Erick Jackson jumped up and down, and drummer Jeff Schmid put on one of the most animated and entertaining live drumming performances you could ask for. His clear kit is something to behold in itself. There’s no telling how long it will last though, seeing how hard heavily he was swinging tonight. It was to be expected, though, they were celebrating the release of their EP, I Know, Vol. 1 tonight, and had hard or digital copies for all in attendance. I’d put Heavy Breathing somewhere between Saturday morning cartoons and that nightmare where you’re kidnapped for ransom. It’s definitely a party worth checking out.